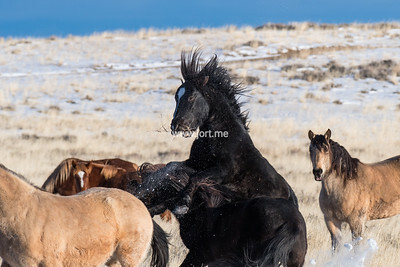 Stallion Takula and two of his bachelor friends came out to check the big herd at McCullough Peaks, and soon the pinto stallion was in a fight with the stallions Handsome that swiftly moved out of the group and have a little fight. 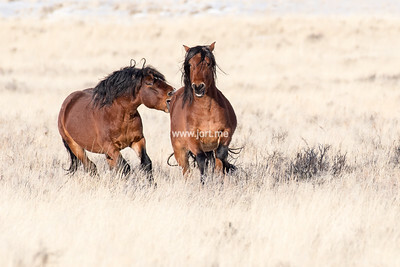 McCullough Peaks herd stallion, named Lansa, in a quarrel with another stallion. 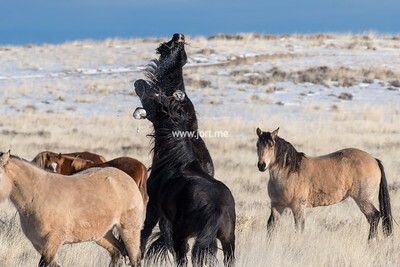 McCullough Peaks herd stallions, Lansa & Jet Stream, having a little fight. 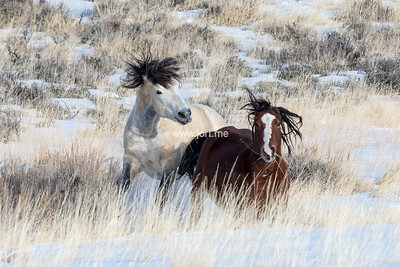 The mares are not impressed. 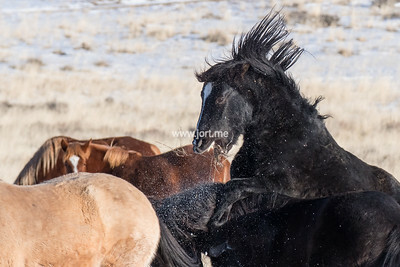 McCullough Peaks herd stallion, named Lansa & Jet Stream. 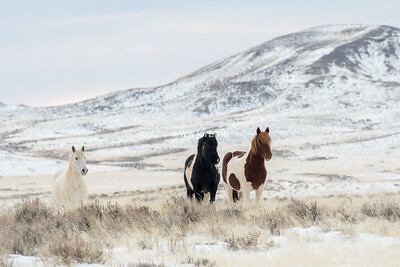 Mare named Tequila observing. 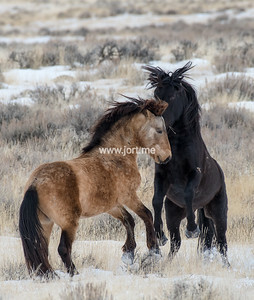 McCullough Peaks herd stallions, named Lansa & Jet Stream, having a fight. 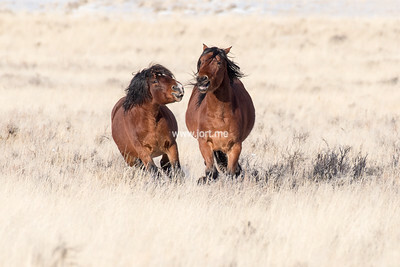 McCullough Peaks herd stallion San Jose chases his mare Seminole. 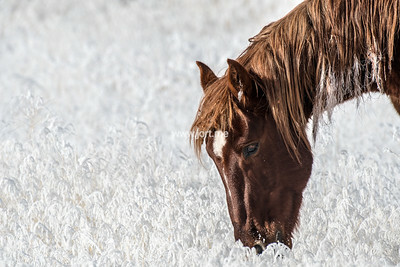 McCullough Peaks herd stallion, named Lansa. 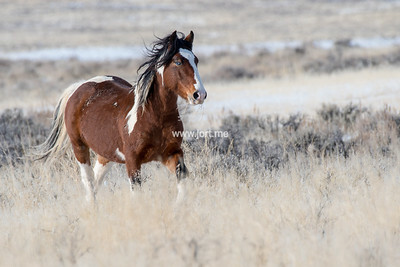 McCullough Peaks herd stallion, named Traveler. 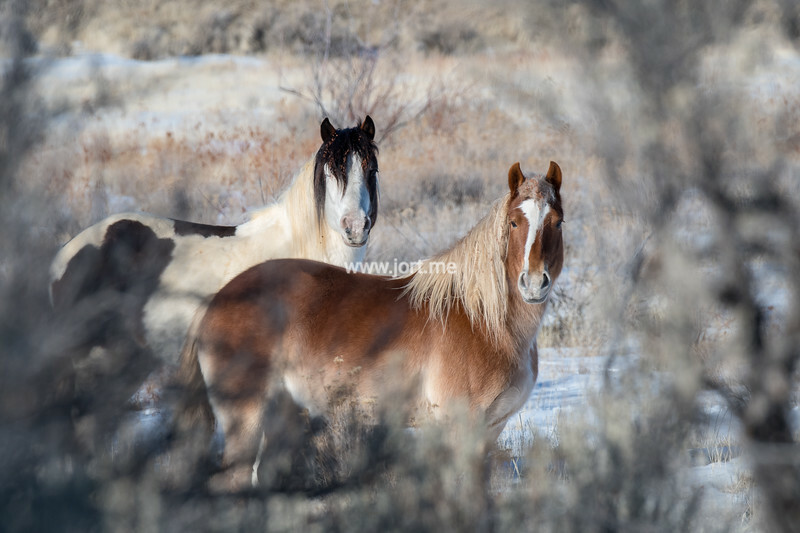 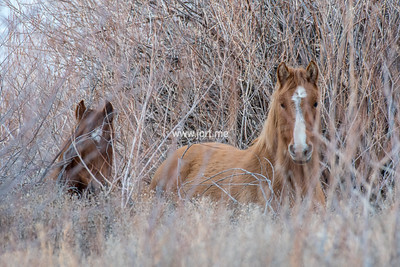 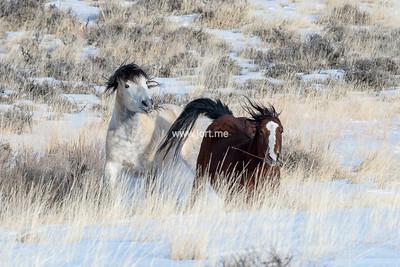 McCullough Peaks herd stallion and his mare; Medicine Hat and Tigress. 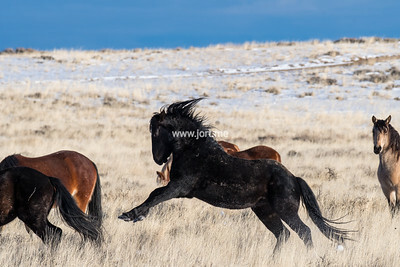 McCullough Peaks stallion .... having a little run. 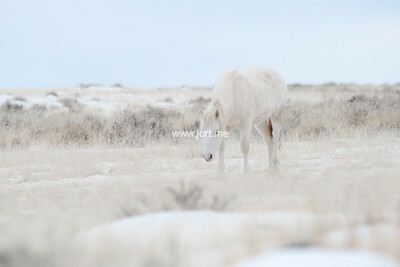 This young foal named Tokala is almost completely white and blent in perfectly in its surroundings. 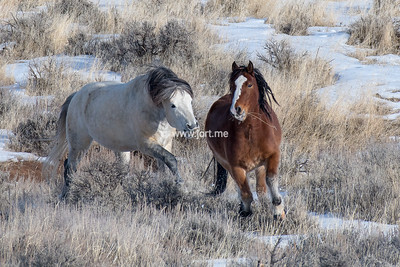 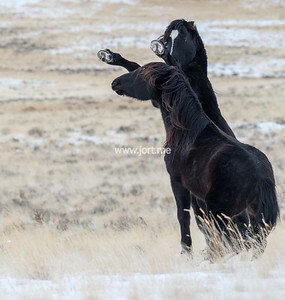 Two stallions of the McCullough Peaks herd having a little fight. 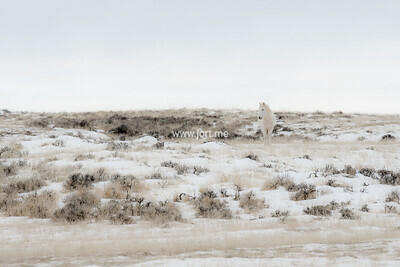 This white foal named Tokala is so white that it moves like a ghost over the snowy fields. 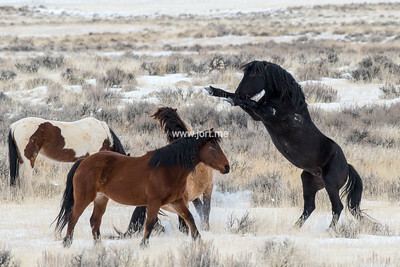 This black stallion rises his legs to hit the other stallion who was clearly not prepared. 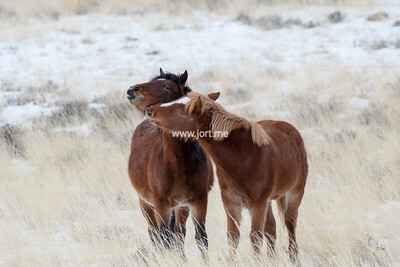 The passing mare couldn't care less. 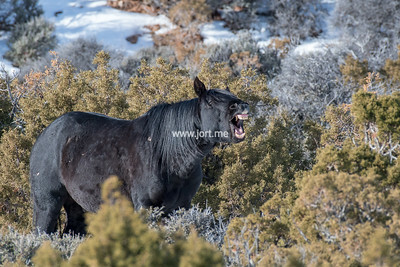 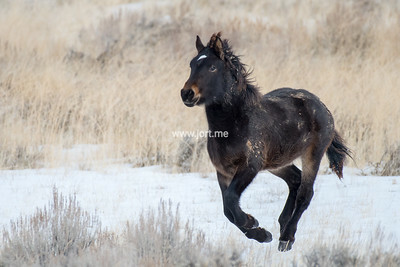 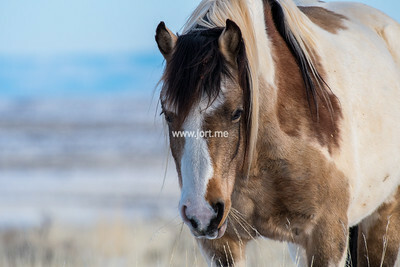 This foal ran between two groups and was not always received very friendly.